Olisa Metuh, the national publicity secretary of the People’s Democratic Party (PDP) who was yesterday arrested by the Economic and Financial Crimes Commission (EFCC), had booked a flight to Dubai as part of an apparent plan to escape from Nigeria. A travel itinerary obtained by SaharaReporters revealed that Mr. Metuh was scheduled to leave Abuja today on an Emirates Airline flight to Dubai. Booked on the same flight was Deputy Senate President, Ike Ekweremadu, who was supposed to travel with the PDP spokesman. Earlier yesterday, four EFCC operatives arrived at Mr. Metuh’s Abuja home and picked him up. 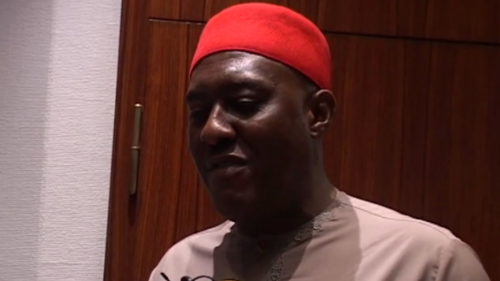 Both Mr. Metuh and officials of the PDP initially played down his arrest, claiming that the party spokesman was “merely” invited for a chat by the EFCC. But they changed tunes later in the day, alleging that the Muhammadu Buhari administration planned to eliminate Mr. Metuh because he was a tough spokesman of the main opposition party. EFCC investigators looking into the reported misappropriation of more than $2 billion of defense funds by former National Security Adviser, Sambo Dasuki, claim that they had traced at least N1.4 billion of the funds to a firm owned by Mr. Metuh. Federal prosecutors have charged Mr. Dasuki, a retired colonel, of diverting funds meant for the procurement of military weapons and equipment to political campaigns for the reelection of former President Goodluck Jonathan. Several high-profile politicians and media proprietors have so far been named as beneficiaries of significant cash dole-outs made by Mr. Dasuki.